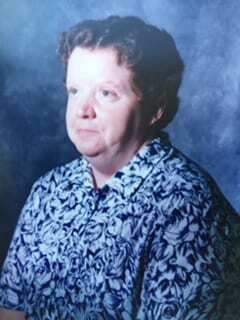 Mrs. Mary Ellis Polly, age 60, of Hiawasee, Georgia, passed away Saturday, October 27, 2018 at Union General Hospital. Mary was born in Young Harris, Georgia, April 15, 1958 to Mr. Ellis Rogers and the late Mrs. Ruby (Gibson) Rogers. Mary was of the Baptist faith, spending many of her youth years going to Calvary Baptist Church with her grandmother. Mary was a true caretaker; she often would take food to people in the community who were ill or offer to babysit children. She looked after her father, making certain he was taken care of, and she also was like a mother to her youngest brother Ray. Her other joy came from gardening and canning the harvest with her family. Her family was blessed in many ways by Mary’s talents but her cooking may have topped it all; everyone always looked forward to a meal at her house, especially Thanksgiving and Christmas. She was a people person. She enjoyed working at the Georgia Mountain Fair part-time and Towns County Schools. Mary is survived by her devoted husband James Polly; sisters and brothers-in-law Sheryl and Edward Tench, Wilma and James Cote; a host of nieces and nephews and many friends and extended family. She is preceded in death by her infant son Joshua David Polly; brothers Ray Rogers and J.B McFalls. The following gentlemen will serve as pallbearers Matthew Frazier, Edward Tench, Luke Woody, Monroe Ledford, Junior Harrison and Shane Haney.Visitation: Monday, October 29, 2018 4:00PM unitl 7:00PM in the chapel of Banister Funeral Home. Funeral Service: October 30, 2018 at 11:00AM in the chapel of Banister Funeral Home with Rev: Bradley Thomas officiating. Next Article » Towns County Sheriff's Christmas Parade: "Making Spirits Bright"